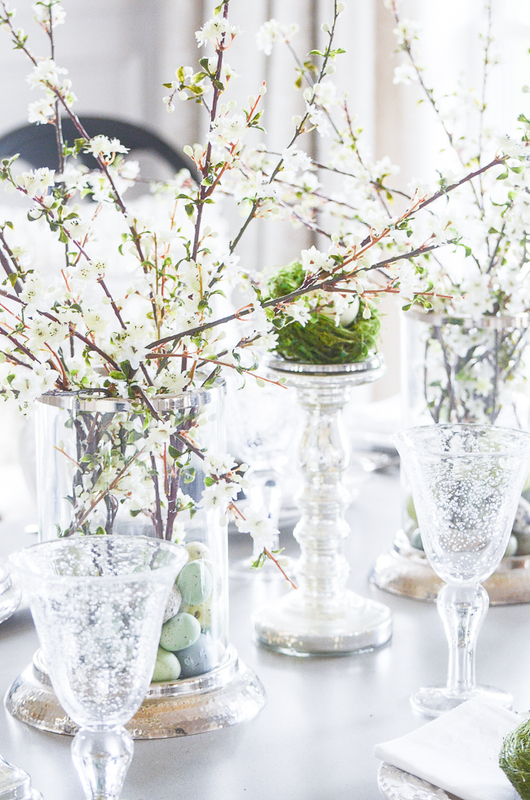 This Easter I’m using the bounty of early spring things to set an easy, airy table. 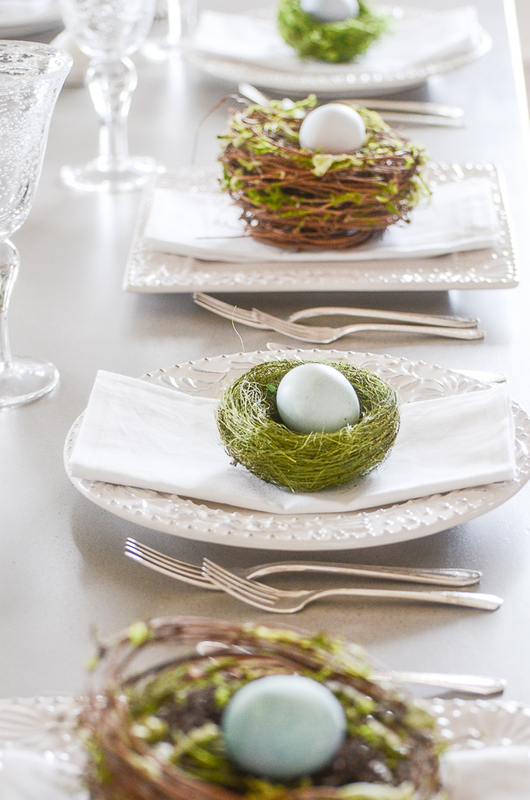 Easter will be here before we know it and it’s time to think about setting an Easter table. Don’t you love early spring? 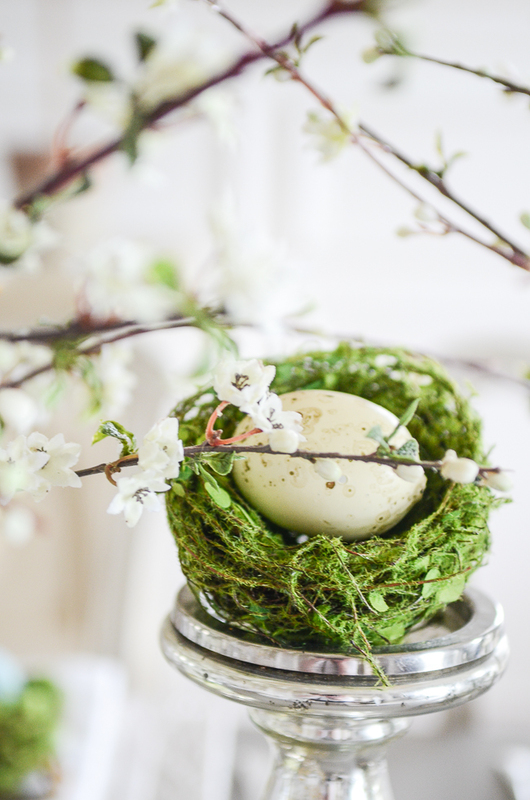 Nests and eggs and sleepy twigs waking up and bursting with delicate buds! Such a welcome sight after a long winter. 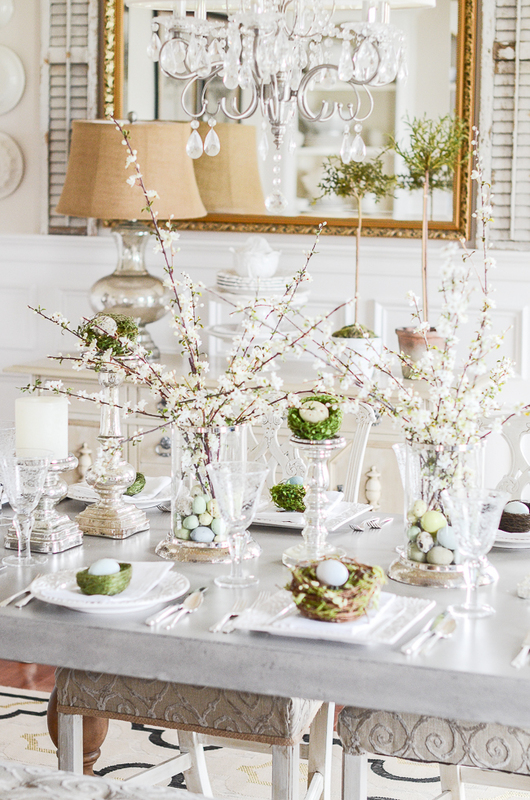 This year’s Easter table reflects all that is beautiful about the season. I am so honored to be a part of this oh, so talented group! We are showing off our Easter tablescapes!!!!! Let’s begin. I’m keeping this table simple and elegant and full of spring inspired charm. 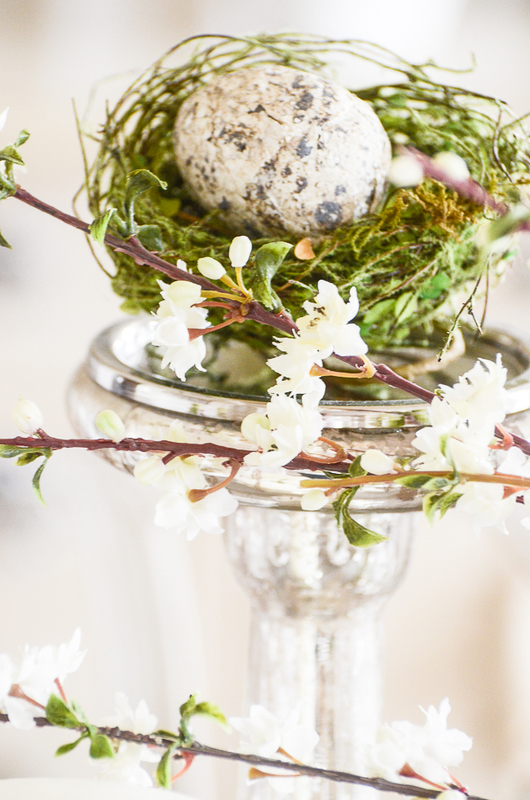 The centerpieces were a spin-off of a 10 MINUTE EASTER DECORATING post I did last year. I used hammered silver and glass hurricanes and filled them up with some delicately colored eggs I’ve collected over the years. 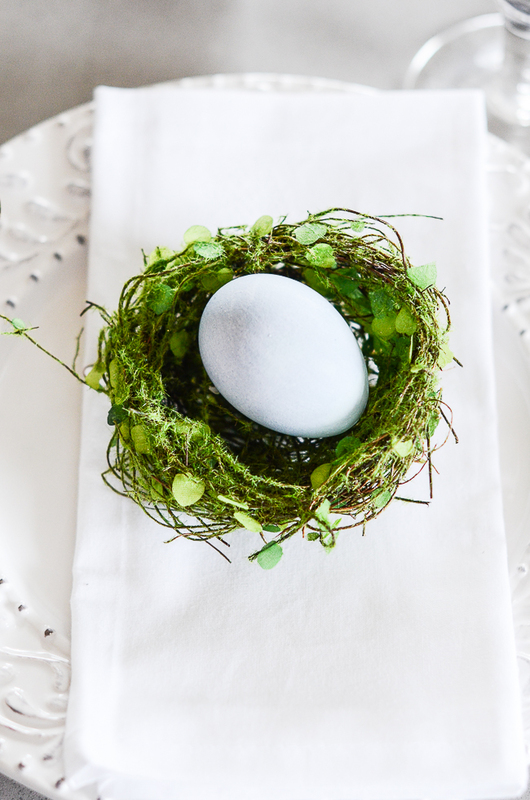 The ends of the white cherry blossom branches are hidden in the eggs. I think this helps to make the branches look more real. I just had book club and used this tablescape. A friend sitting next to me asked if the branches were real! I love that! I grab up beautiful, almost-real-but-faux blooms whenever I see them! They are such a find and a very good investment. I’ve collected these from my local Pottery Barn Outlet over the last two years! 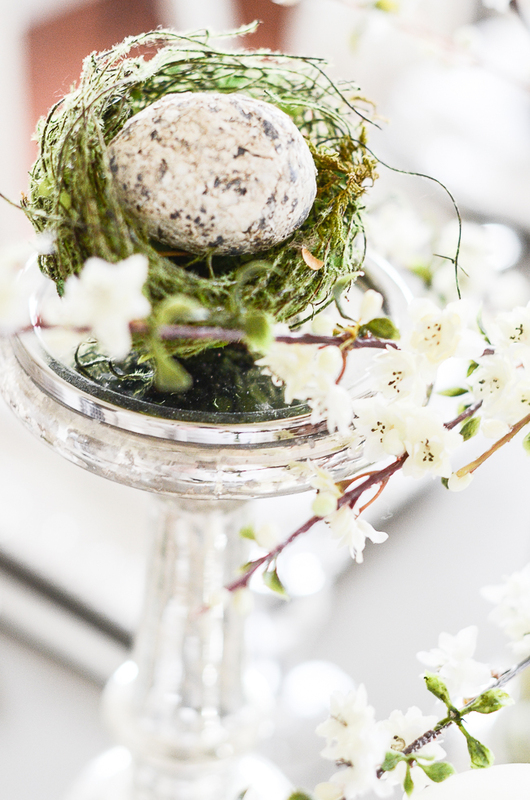 Tiny bird’s nests perched on mercury glass candlesticks gives the illusion of finding a bird’s nest in the branches! I adore creating little surprises in a tablescape for guest to find. No tablecloth or runner this Easter. I’m letting the beauty of the concrete table shine through! It was love at first sight when I found this table but I got terrible buyers remorse while I waited for it to arrive at StoneGable. I bought it without seeing it first hand. As soon as the nice delivery men set it up in my dining room it was love all over again. I have been thrilled with this stunningly unusual table! See my table HERE. This tablescape has a simple, natural look that is paired with some upscale polished touches. I think that is my very favorite way to decorate! A lot of classic styling, simple natural and organic with a little bit of upscale luxe. Sorta classic/farmhouse/chic! One plate with pretty raised edges at each place is all this tablescape needs. I alternated square and round plates of the same pattern around the table. I love love love to stack plates but for this table simple is best! I got the plates from HomeGoods years ago! Simple white napkins are folded on the plates with an assortment of bird’s nests topping off each place setting. 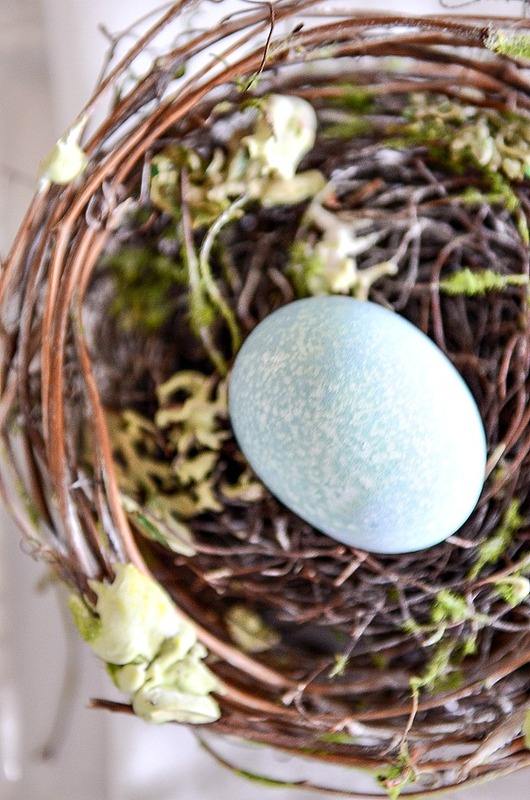 The eggs in the nest are different shades of blue. To a sky blue eggs dotted with areas that look like pinpoint, mottled clouds! My kitchen has been my laboratory for 3 days as I tried to make the perfect naturally dyed blue egg. 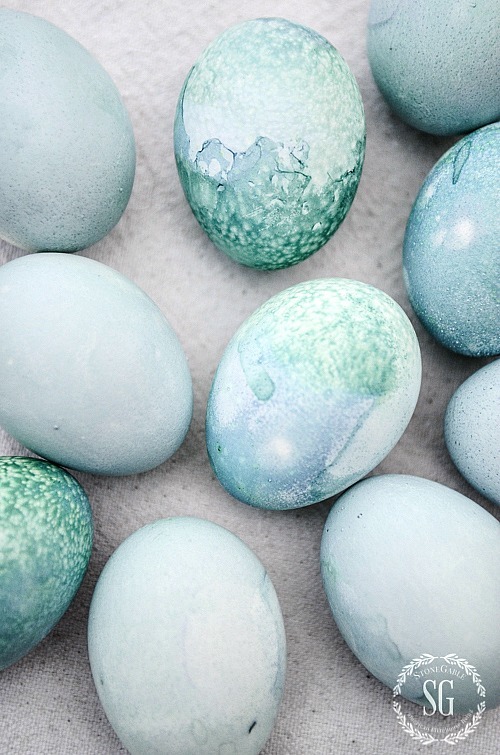 These eggs were so easy to make and I hatched a couple dozen pretty blue eggs! You can see how to make them HERE. My table is ready for Easter! 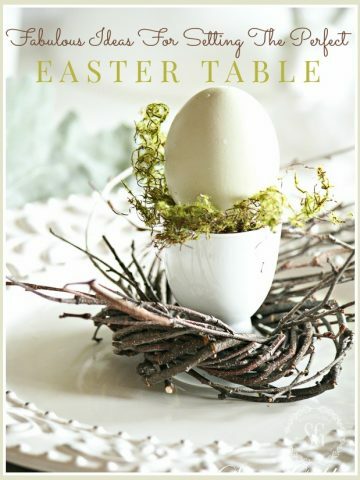 I hope you are inspired and have some ideas to take away and use on your Easter table this year! You can follow me on Pinterest and see all the great things I am finding to pin daily HERE! Yvonne, This is really stunning! Thank you for sharing at Share Your Style! Yvonne, this is so beautiful as always, my friend. I love the twigs with the nests and the little nests. Just perfection! Yvonne, this table is oh-so-gorgous!! This centerpieces are off the charts amazing!! Fresh and lovely and elegant too! Just perfect! Yvonne, your decorations are always so gorgeous! 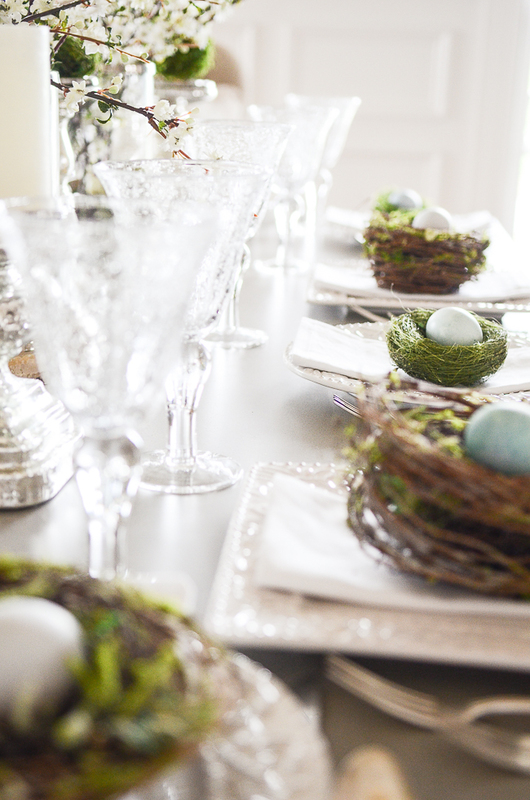 Love, love the simple elegance of your Easter table! Can’t wait to try making the eggs. If you don’t mind me asking, where did you find all of your nests? I have been looking but just can’t seem to find any that look realistic. 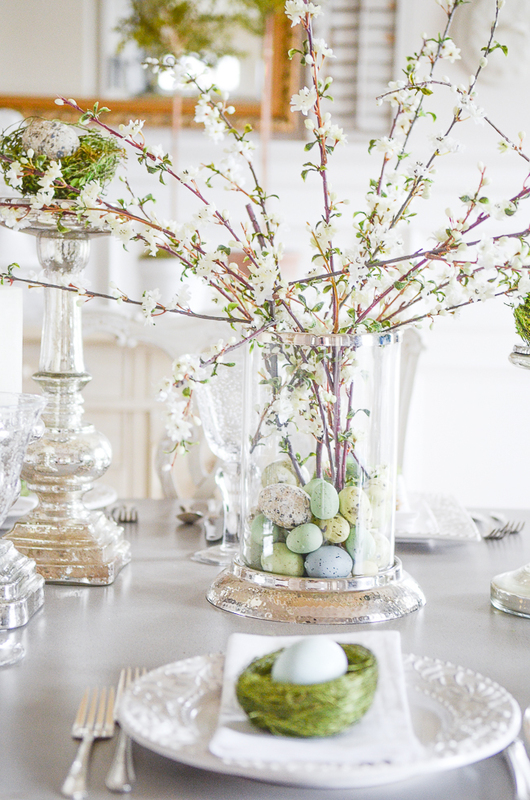 Your Easter table is gorgeous!!! Very elegant!! 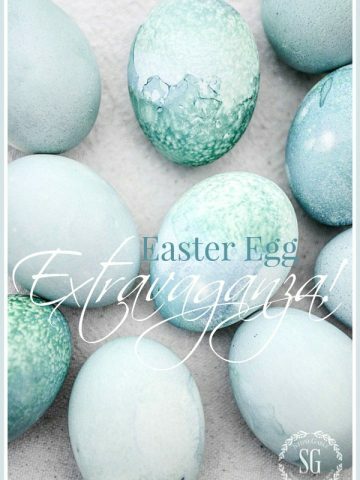 And I love the blue eggs and can’t wait to try making my own! This is just beautiful! 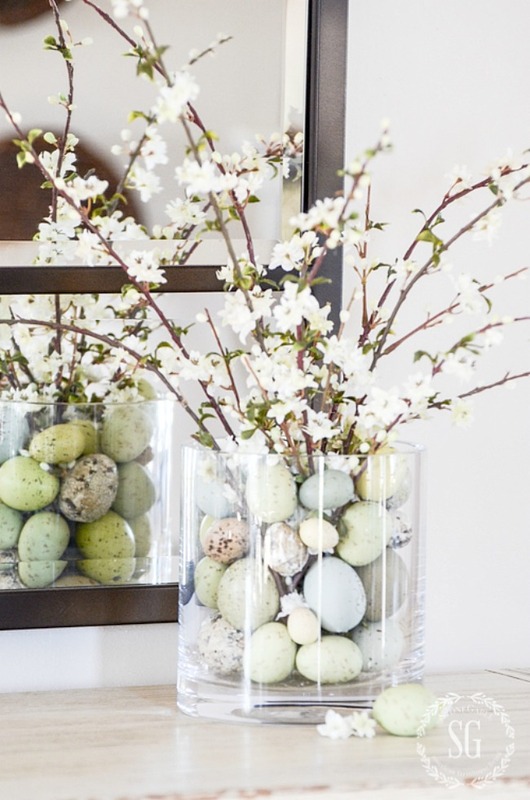 Easter is a little early this year, I need to get a move on for my Spring decorating! 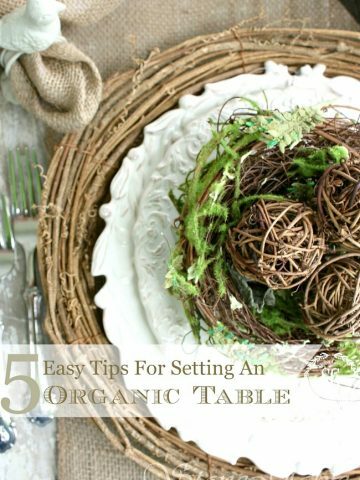 I love the variety of little nest on your dining room table, they are so adorable. Thanks for sharing your beautiful Easter table setting. Have a great day! beautiful decorations very” spring like” ,,,can’t wait for spring! Where do you purchase your nests? Hi Rachel, I find nests at my local decorating shops. I love the simplicity of the design, just lovely. Stunning! Simply stunning! 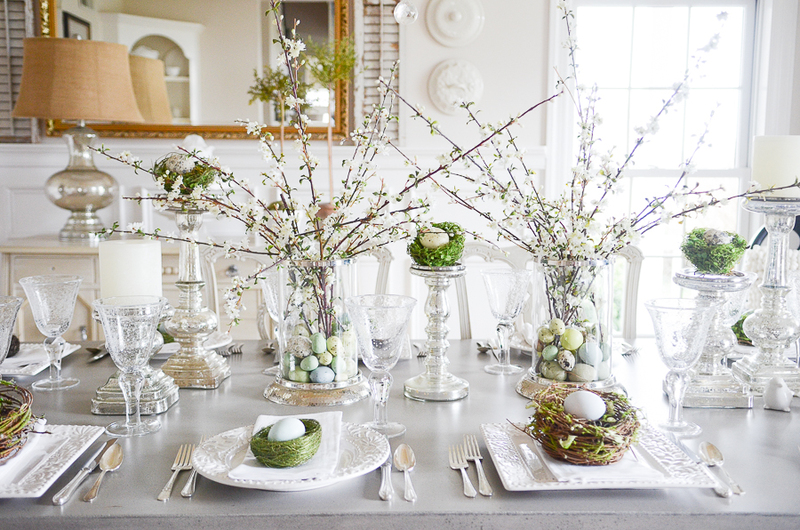 I love the simple yet elegant table you decorated for Easter and early Spring! The “see-through” crystal-like look is amazing and I’ll try it next Spring in my new house. Thank you so much! Beautiful table. I tried your blue dyed eggs last year and everyone wanted to know where to buy. Going for the look again. 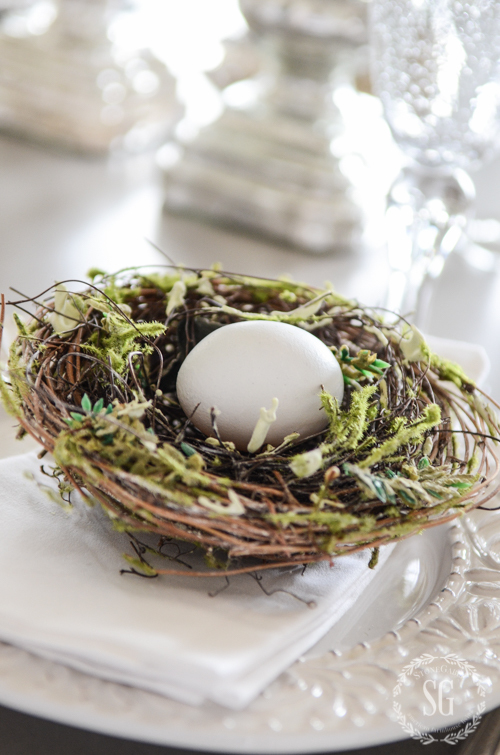 Where did you find your bird nests? Thank you. Beautiful table! 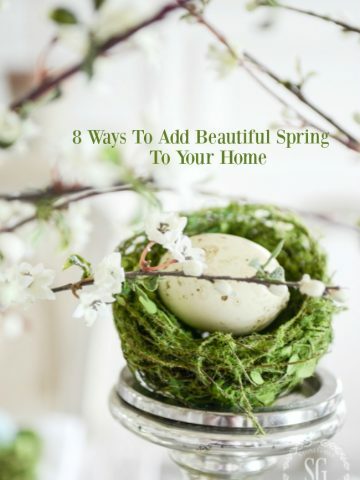 I love everything about the simplicity and spring beauty! Thank you for sharing your inspiring decor! Happy Spring! Happy Easter! Another gorgeous table my friend! 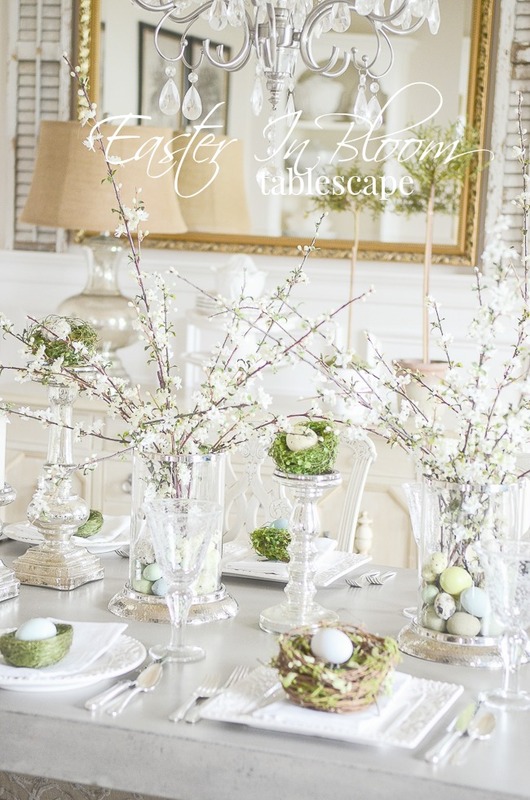 Happy Early Spring and Easter Yvonne….beautiful and fun table as always!